A number of 84 people have been killed by the diphtheria outbreak since October, according to the World Health Organization (WHO) on Tuesday. 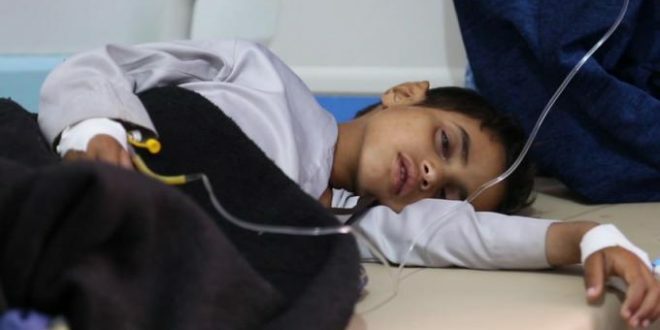 The UN agency said that 1,516 suspected cases of diphtheria have been registered in 20 out of 23 of Yemen’s 23 provinces. Diphtheria can spread as easily as the common cold through sneezing, coughing or by talking to others, according to health officials. The disease Mainly affects children and can cause devastating epidemics if left unchecked. Yemeni health authorities have recently launched a major vaccination campaign across the country in an effort to avert the growing spread of the disease. The ongoing Saudi war on Yemen has devastated basic services, including water and sanitation systems, prompting the UN to describe the situation in Yemen as one of “the world’s worst humanitarian disasters in modern times”.